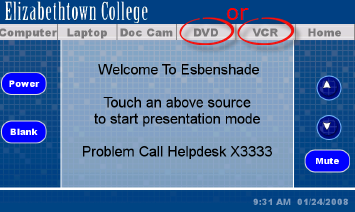 Technology Instructions for Esbenshade 182. If you experience any problems, call ext. 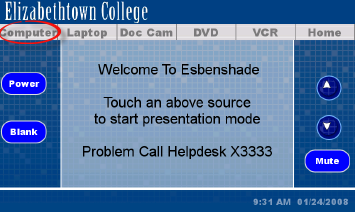 3333 or e-mail the Help Desk at helpdesk@etown.edu. Please visit our web site at http://www.etown.edu/ITS for additional information. Step 1:Press anywhere on the AMX Touch Panel to turn on the panel screen.Step 2:Push the 1st button for the COMPUTER. When you touch Computer, the projector will turn on automatically. 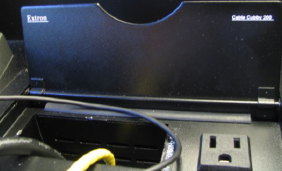 Step 3:Press the power button located on the front of the computer and monitor if not already on. Log on with your network username and password.Step 4:The computer screen image will appear on the projection screen. Step 1:Press anywhere on the AMX Touch Panel to turn on the Panel screen.Step 2:Push DOC CAM. 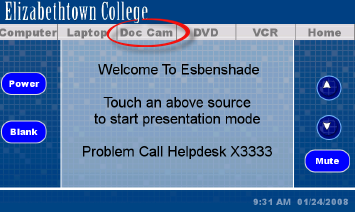 When you touch the Document Camera option, the projector will automatically turn on. Step 1:Begin with the laptop turned OFF in order to connect.Step 2:Connect the VGA cable to the blue port, the Ethernet cable to the network jack, and the sound cable to the headphone jack on your laptop. The cables are found in the cable box on top of the podium. Step 3:Press anywhere on the AMX Touch Panel to turn on the panel screen.Step 4:Touch the LAPTOP button on the screen. When you touch the Laptop option, the projector will automatically turn on. 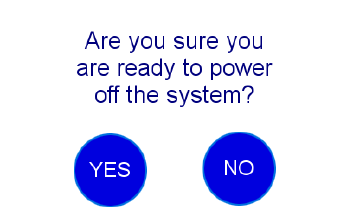 Step 5:Turn on the laptop by pressing its power button. 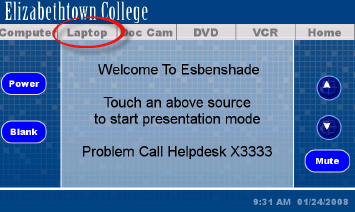 If you need power, plug your power adapter into the outlet in the cable box.Step 6:Press the appropriate keyboard combination to display the laptop image on the projection screen. 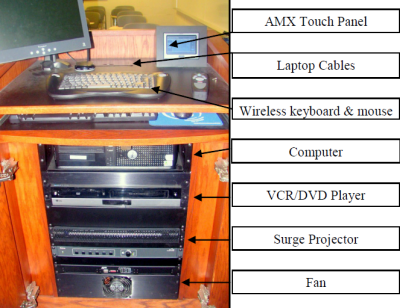 Step 1:Press anywhere on the AMX Touch Panel to turn on the panel screen.Step 2:Push DVD for playing DVDs or VCR for playing VHS tapes. When you touch one, the projector will automatically turn on. Step 3:Press the POWER button on the left of the silver VCR/DVD player if not already on.Step 4:Place either a DVD in the left side or a VHS tape in the right of the DVD/VCR player.Step 5:Use the buttons on the touch screen to control the media. The volume buttons are located at the right side of the screen.